Sydney George Hibbert, AKA “Munez” or “Uncle Munez” was born on 29, June 1916 in Kingston Jamaica at 28 Hannah Street as the ninth child of Solomon Augustus Hibbert and Theodora Elizabeth Marquis. He had eight siblings, namely: Robert Herman, Huntley Ezekiel, Hazel Annatis, Lucile Ione, Ann Myrtle, Joslyn Ivanhoe, Theophilus Euslock and Rudolph George. 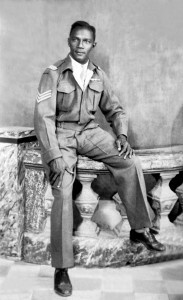 During the 1940’s, he like many Jamaicans answered the call to join the British Army to fight in World War II so he enlisted in the Royal Engineers. His tour of duty took him to Egypt and North Africa. On completion of his military career, he reached the rank of warrant officer. Uncle Munez loved the Army and as a civilian he still played an active role in the Ex-servicemen’s activities. In his later years he lived in a small village called Lip hook Surrey and was known by almost everyone as Syd. Not many know this but he was also a qualified football (soccer) referee and a freemason. After a short illness he suffered a heart attack and passed away on the 6 of October 1983. In a mark of respect on the day of his funeral, as the hearse passed through the village, several shops and businesses closed their doors and lined the streets. He was cremated and his ashes returned to Jamaica for interment. Uncle Munez’ children includes, Owen (with Louise Chin) Rudolph (with Hazel Campbell) and Herman, Marques, Terrence, Andrew and Madelene (with Irene Potter).